There is something effortlessly glamorous about a luxurious knit. 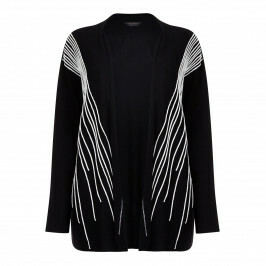 This high neck tunic with decorative monochrome thread detail is the perfect example. The neckline showcases your favourite pair of beautiful earrings. Wear with sleek black trousers to embody the sleek Marina Rinaldi Italian aesthetic. Go against the grain and pair with denim to let your casual wardrobe scream style. Pure wool high neck tunic with white detailing. 100% Virgin Wool. Decorative thread 100% Viscose. Cold Hand Wash Only.